Spring is the season of spectacular blossoms on many plants, including bushes. Some early-spring-flowering bushes bloom before their leaves unfurl. The blossoms really stand out with no leaves to obscure them. Bushes that bloom in early spring should be pruned soon after the blossoms fade. Do not prune them in fall or you will remove flower buds that would bloom the following spring. Covering the bush with delicately-colored blossoms in early spring, rhododendrons (Rhododentron spp.) are one of the most magnificent of all spring-flowering bushes. Most varieties have evergreen leaves; those with deciduous leaves are most often referred to as “azaleas,” although they too can properly be called “rhododendrons." Position your rhododendron in a protected location on the north or east side of your house or protected by a fence or bush. Exposure to afternoon sun causes the blossoms to fade prematurely. Apply a 4- to 6-inch mulch to reduce weeds rather than cultivating the soil to remove them. Rhododendrons have shallow root systems that are damaged by even the shallowest cultivating. A large, deciduous broadleaf shrub, weigela (Weigela florida) grows to a height of 9 feet and spreads up to 12 feet. It is grown predominantly for its showy spring flowers that cover the bush in early spring. Weigela is tolerant of pollution, grows in partial shade to full sun and is not particular about the type of soil in which it grows. It is hardy in USDA Zones 5 through 8. Plant weigela shrubs in shrub borders, as screens, living fences or massed together in the landscape. 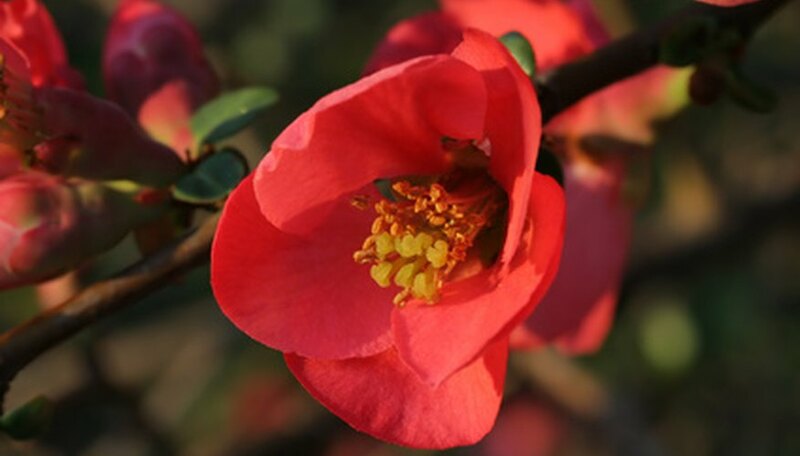 Multistemmed and dense with a tangle of branches, flowering quince (Chaenomeles speciosa) grows 6 to 10 feet tall with an equal width. Bright red flowers cover the bush in early spring before the leaves unfurl. The leaves emerge a reddish-bronze and turn dark, glossy green as they mature. Apple-like yellow-green fruits can be used to make jelly if harvested after October. Flowering quince is grown primarily for its showy spring flowers and is nondescript during the rest of the year.